As has become tradition, here is the wrap up post for the Microsoft reIMAGINE 2014 conference hosted by Dynamic Partner Connections. I had a great time at the conference in Fargo, North Dakota, USA and visiting family in Florida, USA on the way home. The future for Microsoft Dynamics GP looks bright with the upcoming GP 2015 release and with the vision for the later releases. The conference was a fantastic opportunity for me to let the Microsoft Dynamics GP partner community know that I was back out on my own as Winthrop Development Consultants and was available to assist with their development, consulting and training needs. Please do not hesitate to contact me if you need anything. The conference was over and I had said goodbye to all my friends. This is a sad time as I am not sure when I will see them again. I have decided to make sure that I will attend the partner conference for next year (reIMAGINE 2015?). I am yet to decide if I can afford the time and costs to attend Convergence and/or GPUG Summit. Let me know if you have an opinion on whether I should attend one or the other, or both. Now my trip home this time is going to take a lot longer than any of my previous trips. My father lives in England, but has an apartment in Florida and when I mentioned to him that I would be in the USA for the reIMAGINE 2014 conference, he mentioned that he would be in Florida at the same time and that I should come and visit. So I adjusted my itinerary to spend a few days in Pompano Beach, Florida before returning to Perth, Australia. Day three, the final day of the conference arrives. Looking out of the window from my room shows that the weather has not changed much, it is still cold with snow covering more of the ground. Roll on Day two of the conference. There were a few bleary eyed attendees at breakfast and for some reason the breakfast hall looked a little emptier today. Fargo put on another brisk day for us with -6 degrees Celsius, 21 degrees Fahrenheit. The nicely decorated tree could not keep me outside any longer than it took to take this photo. It starts…. reIMAGINE 2014 is the first conference I have attended since the Convergence 2012 in Houston, so after about two and half years it was great to be back in the madness that is a Microsoft Dynamics conference. The day started with a breakfast for all attendees in the Great Hall at the Holiday Inn. I finally found Mariano as he was right by the door chatting to all his groupies. I am sorry it has taken so long for me to get back to writing the #reIMAGINE2014 series of posts. As you will see it has been a very busy time for me and writing the blog articles fell to the bottom of the heap. 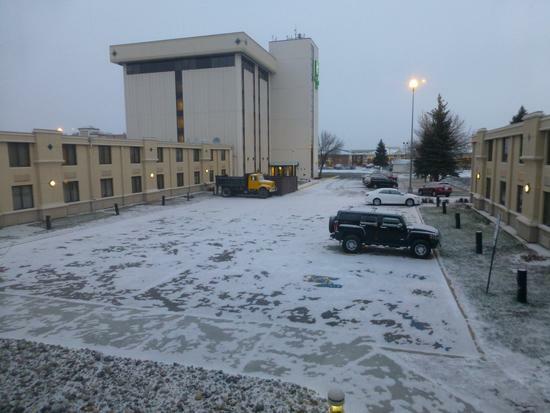 After my long 37 hours in transit to get to Fargo, I had settled into my room at the Holiday Inn. The room was on the second floor and was one row back from the pool area. This was good as it meant I avoided the noise from the pool as well as the chlorine fumes (other than the base level of chlorine fumes for the whole building). Today’s blog post comes to you from Fargo, North Dakota, USA. At 8pm (GMT+8) on Thursday night, I started my long journey from Perth, Western Australia to Fargo. This time around I was trying a different approach to making this trip; instead of starting by flying with Qantas to Sydney and then across the Pacific Ocean, I am flying with Qatar Airways directly from Perth via Doha, Qatar.